When Vision Development first opened its doors in 2011 one of our very first Clients was looking to hugely increase the size of their existing chalet bungalow in rural Highclere, near the historical Highclere Castle. With planning taking time to be approved, our Clients kept in contact with ourselves to ensure that we were updated on the happenings with the build and when planning was eventually granted we were able to commence at the beginning of September 2016. We were luckily enough to be provided with a sequence of photos from the Client on how the build progressed from very start to where it is at present. As you can see the two large timber frame extensions really transform the existing bungalow to create a spacious home with plenty of additional rooms. Our project wasn’t a simple one, but there again it would seem that most things we do never are. Unlike most people who are sensible and build a house from the beginning so everything is designed together, our project was to turn an existing poorly insulated 1960’s chalet bungalow into a large more efficient aesthetically pleasing house. Many timber frame manufacturers wouldn’t entertain such a scheme due to the technical difficulties of matching the new timber structure to the existing masonry walls. Vision Developments however were happy to take on the challenge. 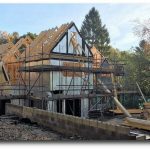 They worked with us and our drawings to design the structure that would enable them to match the new timber frame to the old imperfect walls. Just to make things more difficult for them we then broke the news that we also remaining resident in the house during the work. Un-phased by our stupidity Vision put together an efficient sequence of work to seamlessly remove the existing bungalow roof, erect the first floor wall panels, partitions and crane in the huge 9 metre wide roof trusses to complete the outer shell as quickly as possible. It was very much a case of “Off with the old and on with the New” which enabled the building to be stripped and water proof again all within one month. During this time there were a few hic-ups and challenges where we would make a few “last minute” adjustments. The workmen on site however were very friendly and organised, and worked efficiently to deal with these issues to get our structure up as fast possible. Without the confident, helpful and professional approach of Vision Development the work to our house would have been far more difficult and stressful and we would not have been able to remain in the dwelling while the work progressed. We highly recommend them. The images and captions below show the progress of the construction. You can find out more about timber frame extensions and see our range of extension projects. If you would like to find out more about how we can help you cost effectively and quickly build a beautiful. spacious and quality extension please call us on 0118 971 21801, send us an email or use our contact form. The original chalet bungalow before the extension. The foundations being completed for the first stage of the extension. The scaffolding is erected in preparation for the arrival of the timber frames. The ground floor panels are beginning to be erected along with the steel beams as required by engineering. The external ground floor panels are in place with the remaining panels and posi metal web joists ready for installation. The posi metal web joists are now installed ready for the flooring. The flooring has now been installed. Once the flooring had been completed the first floor panels could be completed. Trusses being lifted into position by a crane. A view of the internal panels and trusses through a window opening. A different view of the first floor panels and the forming of the roof with trusses and rafters. This is a view from inside the new extension of where it meets the original house. We removed the existing roof in preparation for the additional first floor extension. This view shows the scale of the new extension along with the preparations for the first floor extension to the existing structure. After the existing roof was removed the new first floor panels can be installed over the existing bungalow. Side view of the new first floor extension to the existing bungalow. Top view of the new first floor extension with the internal partitions now installed ready for the roof trusses arriving. Once the trusses were all in place they were covered with plastic to provide a temporary covering until they are felt and battened. An inside view from the ground floor up to the roof. With the roof completed it can now be felt and battened ready for the roof tiles to be hung. This is a great view of the complete transformation of the home using timber frame extensions. The external brickwork has been completed but the roof tiles and windows are yet to be fitted.